Koei Tecmo may have let one of Nintendo’s E3 surprises slip, as an unlisted video from their YouTube channel has popped up all over the internet. 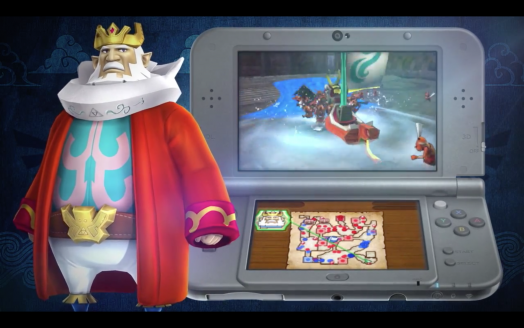 That video is none other than a trailer for Hyrule Warriors for the Nintendo 3DS. Presumably this was meant to be revealed during Nintendo’s Digital Event on Tuesday morning, but somehow the video was leaked to the public. The trailer starts out innocently enough; at first it appears as though it’s Hyrule Warriors 2 for the Wii U, but this thought is quickly put to rest when the video quickly morphs onto a 3DS screen. The graphics for the game are similar to that of Super Smash Bros. for 3DS, with a cel-shading outline to the characters, while still very much maintaining the original Hyrule Warriors look. The trailer also reveals two brand new playable characters for the Dynasty Warriors spin-off: Tetra and the King of Red Lions. Tetra cuts through her enemies with her short sword and the King of Red Lions transforms into his signature boat form, blasting enemies away. These are two great additions to the Hyrule Warriors family and considering the lack of Wind Waker representation in the original version, it is quite fitting that the game is finally getting some love. The graphic at the end of the video seems to suggest that by owning the 3DS version of the game, you are able to unlock Tetra and the King of Red Lions on the Wii U version. This isn’t confirmed, but there will definitely be some kind of connectivity between the two games. As this trailer was apparently meant to be saved for E3, it will be interesting to see how Nintendo responds to the leak. Will they acknowledge the game’s premature reveal and send out a press release, or will they continue with the originally planned reveal? Regardless, the cat is out of the bag now. Koei Tecmo has made the video private, so this was obviously a mishap. The trailer has been re-uploaded, however, as you can see below.